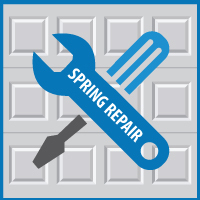 Picture this: You walk into your garage in the morning, hit the garage door opener button, and—snap—your garage door torsion spring just snapped. Now what? Pages that recommend that only a qualified technician work on your garage door torsion spring. Both sides of this argument are trying to sell you something, whether it be the service itself, or the parts and tools needed to attempt to repair your garage door torsion spring. We could easily tell you, as a company that services garage door openers and torsion springs that replacing said torsion spring is a confusing, dangerous, and complicated process that could result in a hospital trip (Same advice if you’d like an official Red Ryder, carbine action, two-hundred shot range model air rifle: You’ll Shoot Your Eye Out). However, with YouTube and About.com available to show you how to replace it, we can’t argue with your desire to save money and feel handy. Here is a 20-minute video on replacing a garage door spring on YouTube (It doesn’t take 20 minutes). Here is a short explanation on how to repair your torsion spring on your own for around $150. You were going to find them anyway. Now that you’ve taken the time to watch and read, we have a few questions. Wondering about what size torsion spring you need? You will be waiting for a company to ship you materials? You will have a hard time finding a company that will sell a torsion spring to an amateur? Worried about unwinding a cable under intense pressure? If you feel confident in your ability to follow every step perfectly, you’ll have your nonrefundable (All Sales Final) torsion spring kit in the mail in about three business days (via Garage Door Nation FAQ). Then, you can start the process of the repair, which will take a few hours if you do it right. Sit back, grab a beer, and let Blue Sky Builders replace your garage door torsion spring. Contact us today.